On my home desktop I had been using Pidgin (formerly Gaim) and Thunderbird without any password phishing agents like Gnome-Keyring (and Kwallet which never showed up). There is no use of a password phishing agent on a home desktop where you are the only user. But the problem surfaced in PCLinuxOS 2009.2 on which I started using Kmail and Kopete. Overall I was happy at the growth of both these KDE apps, except that kwallet phisher. I remember right after the fresh installation of pclos 2009.2 I had removed kwallet, but when I fired up kopete and kmail, the kwallet started buzzing me to give a password. And there was no escape, I removed all that hidden kwallet craps and config files from my /home as well as /root directory. Again gave kopete a try, but kwallet came up adamantly and asked for password. Perhaps some kwallet daemon is running all the time. Thank God! I finally found a fix to disable kwallet at OpenSuse forum. Save the file and reboot your system. Henceforth, kwallet phishing agent won't show up. From the days of Red Hat 7 till now I have seen many people (windows users) try Linux. But most of them go back to Windows after time of playing around. Why? Hang on. Before digging why people go back to windows, let's see why anybody looks for an alternative operating system such as Linux or BSD. Is it for the reason that windows is not free? Is it for the reason that Windows is closed-source? Or is it for the reason that Windows is prone to viruses and malware? Here in India, maximum people are not worried about the price-tag attached with Windows. Because in many cases the PC comes preinstalled, and if not, installing a pirated copy of XP is not that difficult. You would be surprised that most people give a damn to software-piracy. Even many people think that cost of Windows XP is just Rs. 50 (that around 1$ - the approx. price of Windows XP in most parts of India). For them Windows XP costs the same amount as a PCLinuxOS or Mepis disk. Now on to the nature of operating system - they don't care whether it's open-source or closed source as long as it works. Next is the issue of viruses, spyware and malware. According to me it's the only reason that attracts many people to linux, in India. They hear people talk - linux is very secure. Then why do they quit? The reason is they expect exact counterparts of Windows application software in Linux. For example, a lay-user after switching to linux seeks for a MS Office alternative in Linux and hits at OpenOffice. Unfortunately he/she doesn't get the same productivity from it. OpenOffice is not that polished, fast or user-friendly as MS Office. OpenOffice is growing feature-wise, but every release leaves makes some edges rough. I have never seen a decent grammar checker in it. Of course, OpenOffice is free, but then, most users also don't pay for MS Office. Its pirated copy comes for around Rs. 50. There are many programs such as photoshop, corel, 3D designing and animation software, audio/video editing software, etc. that run on windows, and they are not ported to linux. Given the present condition of fragmented linux community, they probably will never be ported. 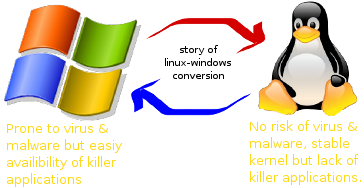 For many users viruses and malware are less annoying than substandard application software that's why windows is leading on the desktop. We all know linux kernel is more advanced and way better than windows. Linux Gui (KDE and GNOME) has also come a long way to be as good as or better than explorer (in windows) and aqua (in mac). Driver support has also improved a lot. But everything is lost due to lack of proper application software. PS: This post is about why linux is unable to make a mark on desktop. I know, Linux is the king on servers. Operating System. It's our attempt to re-think what operating systems should be." The above proclamation says it all! It'll be nimble, fast and secure - meeting perfectly to average users' demand from a home desktop connected to the Web. Based on certain version of Linux Kernel it will ready in the second half of 2010. 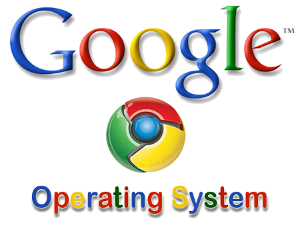 Google plans to bring it in a grand way, that means it will come preinstalled in many netbooks, notebooks and desktops. Needless to say, it will have everything from Google bandwagon, plus moderate bundles of office productivity and multimedia applications. Read Google Blog for more. The day before yesterday something fateful happened. I laid my hands on my brother's refurbished notebook (an old Thinkpad R, the labels are worn away) to install PCLinuxOS 2009.2 MiniMe, and by mistake deleted all the partitions. It had Windows XP installed on its C: drive and all the data (including some serious financial notes, online banking passwords, etc.) were stored on D: and E: drive. I could have undone the "delete partition" thing, but to my bad luck, the laptop just died there due to power failure. Then I began the disk recover hunt frantically and came across RIPLinuX and some of the recover tools it has, most importantly TeskDisk and Photorec (Later I came to know that PCLinuxOS repository also has both these tools. Had I known it earlier, it could have saved my time downloading around 100 MB). I just popped up the RIPLinuX 9.3 and within 1 minute got my old FAT32 partitions restored. Here is what I did. RIPLinuX is very nimble when it comes to booting - quite fast and without much verbosity. I logged into RIP with Administrator privileges (root user) and issued "testdisk". It led me to an ncursed based interface. The first step asked me to whether I would like to create a log file. I chose "CREATE". The second step listed all the disk drives and prompted me to choose one. The third step was about choosing the type of partition table. I chose the default (TeskDisk often highlights the right type for you). The fourth step was the actual recovery procedure where I chose "ANALYSE" option followed by "QUICK SEARCH", and TestDisk displayed all the deleted partitions. Finally, I had to "WRITE" the changes to the disk. Recovery Is Possible (RIPLinuX) is a Slackware-based Mini distribution using which you can create a bootable CD or USB drive. It can recover partitions and files of a lot of filesystems including Reiserfs, Reiser4, ext2/3/4, XFS, JFS, UFS, HPFS, HFS, MINIX, MS DOS, NTFS, FAT32 and More). Mandriva 2009.1 seems me the best release so far. I have not faced a single problem from the day I installed on my work PC. Wireless, bluetooth and almost any device work flawlessly. But I used to see this error message during boot and shutdown. All you Mandriva 2009.1 users, here is the fix to stop the above error message. Comment out CRDA_DOMAIN=US in /etc/sysconfig/network and you won't see that error message on during booting or shutdown. Caution: The error message may come live again if you update some packages (related to networking). But then nothing to worry, you can again put a # before CRDA_DOMAIN in /etc/sysconfig/network file.